It took me about three seconds to register what he actually said, then we both just laughed. Why might that be? Many consider carp as a junk fish. However, in some parts of the world within different cultures, carp is thought of as a prized fish to cook and eat, like a delicacy meat. To help make things easy, and in hopes of changing the minds of those who have been discouraged by the mere thought of this common fish, the following carp recipes should be sure to please, and may even surprise your taste buds. Add about 2" deep of cooking oil to a deep style frying pan and pre-heat to a high temperature of 375°F. In a small bowl, combine the evaporated milk and egg, whisk together well. In a separate bowl, add the cornflour and season with salt and pepper. Dip the strips of carp into the milk mixture, then remove them while shaking off excess liquid. Generously coat the strips in the cornflour. Remove them and shake off the excess flour. Carefully add the coated strips into the heated oil without overcrowding the pan, and being sure they are fully submerged in the oil. Cook for for about 4 to 5 minutes on each side until golden brown and done. Remove them and place on a paper towel to drain. 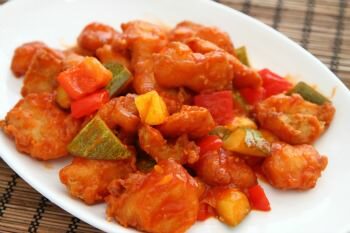 Serve with sweet and sour dipping sauce, fresh pineapple slices, and sliced bell peppers. Have a quick look here to get some helpful tips about deep frying fish. This is one of those carp recipes that was inspired upon me from my wife's grandparents, whom are Italian, great home cooks, and love to eat and drink fine elegant wines. Hope you like this. Enjoy! Preheat the oven to 350°F. Meanwhile, drizzle a baking dish with olive oil to evenly coat the bottom. Add the carp and season with salt and pepper. For the gremolata, mix together the minced garlic, minced parsley and lemon zest. In a separate bowl, combine the bread crumbs with half of the gremolata and mix together. Rub the bread crumb gremolata mixture onto the fish, and drizzle with more olive oil. Bake for 15 to 20 minutes or until done. Garnish with the remaining gremolata and lemon wedges.